The “firing off the guns” on New Year’s Eve is a long established tradition in Newfoundland and Labrador. The “feu de joie” or “fire of joy” is a gun salute that was common place in Newfoundland in the past, an activity that is associated with bringing in the New Year. The tradition continues in many communities in Newfoundland and Labrador, at the stroke of mid night gun shots are fired as residents bring in the New Year. In his article he notes that the tradition of the “firing off the gun” is not as popular as it was fifty years ago confirming that the tradition has been established in Newfoundland since at least 1842 and perhaps much longer. The law was introduced in Maryland because gunshots were the common method of warning neighbors of an emergergency (fire) or a pending attack. Because so many people were shooting guns while celebrating on New Years Eve and other celebratory occasions, it was impossible to know what was happening. It is a tradition that is gradually fading – with the “shooting in the New Year” being gradually replaced by fire works that have the advantage of supplying both the noise and visual effect. New Year’s Eve Countdown & Fireworks : When the clock strikes midnight on Dec. 31, the people of Newfoundland are the first in North America to celebrate the New Year. 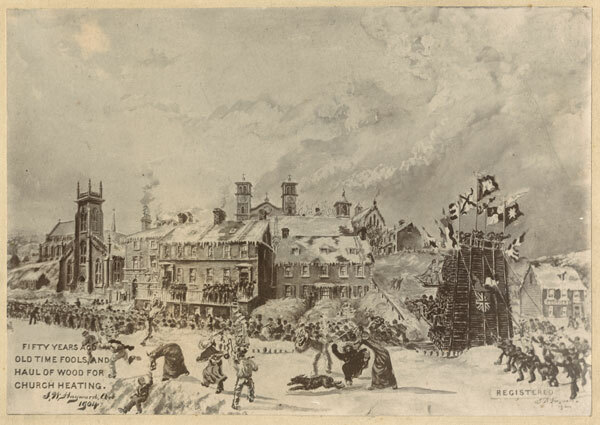 This entry was posted in Archival Moments and tagged Arthur C. Waghorne, Auld Lang Syne, Ferryland, feu de joie, firing off the guns, Lord Baltimore, Maryland, New Year's Tradition on December 28, 2018 by Larry Dohey. This entry was posted in Archival Moments and tagged Arthur C. Waghorne, Auld Lang Syne, Ferryland, feu de joie, firing off the guns, Lord Baltimore, Maryland, New Year's Tradition on December 29, 2017 by Larry Dohey.